Oculus Quest offers a strange new world for virtual reality – one where no wire or walls can constrain or restrict the experience. There are a lot of unknowns still (battery life among them), but so far it seems Project Santa Cruz was worth the wait. Oculus Quest, the latest member of the Oculus family, has been in the works for years. It’s been cooking in the minds of engineers (and fans) since around the time the Rift first launched in 2016, and now Oculus is finally ready to release it to the world later this year. Unlike the Oculus Go that came just before it, the Quest headset will offer six degrees of freedom tracking that will allow you to walk around anywhere without a wire holding you back while still allowing lateral movements, crouching and jumping. Update: Oculus Quest isn't the only new VR headset in town, the HTC Vive Cosmos is a mysterious new HMD from the maker of the Vive that has the potential to throw a wrench in Oculus' plans. Here's our first look at the HTC Vive Cosmos. That freedom is great but it comes at a cost: to some extent, the Oculus Quest is less powerful than an Oculus Rift, that requires an Nvidia 960 GPU or better to operate. But that doesn't mean it’s running on half-baked hardware – Oculus Quest is a mobile VR headset that looks almost as good as its tethered counterpart. When it arrives later this year, Oculus Quest will bring 50-something titles along with it – including Star Wars’ Vader Immortal, Superhot VR, Stormland, Moss and more – all of which are optimized for standalone VR. All these titles will use revamped versions of the Oculus Touch controller that will be tracked by four ultra-wide sensors on the side of the headset. It’s asking a lot from a headset that has nothing connected to it and handles all the processing inside the unit itself – but, at just $399 (about £300, AU$550), it’s one we can’t wait to get into our own home. At Oculus Connect 5, Facebook CEO Mark Zuckerberg announced that Oculus Quest would be available starting in North America in "Spring 2019" (so March-April). Zuck has yet to give us an exact date, but with Springtime just around the corner in the Northern Hemisphere, we won't have to wait much longer. When it arrives, the Oculus Quest will cost just $399 (likely between £349 and £399) –which is about the same as a new 4K game console like the PS4 Pro or Xbox One X. Depending on how in-love you are with virtual reality, that number will either shock or appall you, but considering that wired VR headsets like the HTC Vive launched at $799 (£799 / AU$1,199) just two years ago, it’s nothing short of a miracle Oculus Quest costs as little as it does. The reason it costs what it does is that the Oculus Quest is a standalone headset. That means, for both better and worse, all the processing power the headset needs is baked right in. 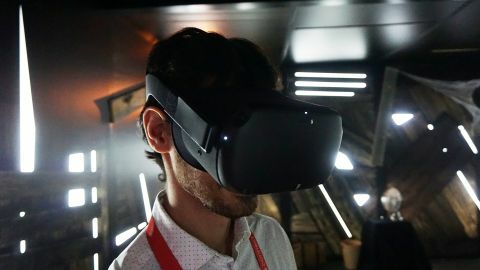 But, while you won’t be able to upgrade the headset two years down the road like you can with your PC-based Oculus Rift setup, Oculus Quest is a headset that goes where you go. The idea of a tetherless headset might sound scary at first – especially if you’ve come to use the wire as a sort of safety line that lets you know you haven’t drifted too far away from the safe play space you’ve carved out for yourself. But don’t worry, the chaperone system is still alive and well in the standalone headset and it will prevent you from, say, walking into the street during a game of Superhot VR. According to Oculus’ Hugo Barra, the Quest can track up to 4,000 square feet – a massive difference in distance to compared to what we’ve seen on wired headsets so far. That should give you enough room to map out the entirety of your backyard or a small field at your local park. To keep you from walking too far, and to track the new-and-not-so-improved Touch controllers, the Quest uses four ultra-wide sensors located along the outer edges of the headset. The sensors act like smaller versions of those that come with an Oculus Rift – allowing the headset to track where your hands are, even if it loses sight of them for a few seconds. While Oculus has been cagey with definitive specs, it sounds like the Quest will share the same resolution as the Go – around 1600 x 1440 per eye. Like both the Rift and Go there’s a focal slider hidden under the front of the headset that gives you the option of shifting the focal distance (although, glasses-wearers are most certainly welcome here). Also conveniently located under the front of the headset is a volume rocker. Audio comes out through the head straps near the ears but, if you’ve got a better audio solution, the Quest has a standard 3.5mm auxiliary jack located on either side of the headset. The headset itself has a soft, cloth-like quality that feels good in the hand. The straps that go behind your head are made of a stretchable rubber material. This is a break from the more rigid plastic straps found on Rift. Even better, the Quest's straps stretch to go around your head before snugly cradling it. The whole contraption is secure as you move around VR worlds, with no slippage. It feels akin to wearing a well-fitted hat. So what can you expect to be playing on the Oculus Quest when it comes out? Well, as it turns out, quite a lot actually. According to Oculus, there will be over 50 games available on the headset when it launches. The most exciting of the lot is a three-part experience developed by Lucasfilm, ILMxLAB and Oculus called Vader Immortal that takes you to the planet Mustafar. ILMxLAB has worked on a number of Star Wars-based VR experiences in the past, but this one will be exclusive to Oculus’ standalone headset. Alongside Vader Immortal, Oculus has confirmed Quest ports for Dead and Buried, Superhot VR, The Climb, Face Your Fears, The Unspoken, Robo Recall, Stormlands and the uber-popular rhythm game Beat Saber – all of which will be optimized for the mobile processor. We also expect a number of Quest-only games to be announced before the headset arrives on our doorstep in 2019. One shown off at Oculus Connect 5 was called Project Tennis Scramble which feels a bit like Wii Sports for the VR era. A number of developers we spoke to on the show floor mentioned that standalone VR was going to be a focus for them moving forward and that the headset would enable unique experiences that wouldn’t be possible with wires. So how do these games look on Oculus’ standalone headset? The answer is ... well, not bad. In the demos we got with the headset, games looked refreshingly crisp. Superhot VR gave us a good sense of realism without a significant amount of noticeable jaggedness, and Project Tennis Scramble radiated beautiful colors without revealing any imperfections. While it’s not hard to poke holes in the Oculus Quest’s performance when you stack it up against something with a bit more power – like the HTC Vive or HTC Vive Pro – Oculus has smartly traded a small amount of visual fidelity for freedom of movement and thus far we have yet to see any game the Quest can’t run. …and yet, we’re sure those games exist out there somewhere. At some point down the road it wouldn’t surprise us to hear about a game that will be available on the regular Rift, but not on the Quest or Go. That will be a disappointment but it is the reality of a platform that will be sold as-is without a way to upgrade. Speaking of things you can’t upgrade, no one we found could give us a definitive answer on how long the Oculus Quest’s battery would last for – with some stations changing out headsets every four-to-five demos. Demoers say the change was to ensure the optimal performance for the headset, but battery life is still a likely suspect for the switch. If the battery doesn’t last more than a few hours, that wouldn’t surprise us. After all, the Quest needs to display video, communicate with controllers and pump out audio all at the same time. It’s worth keeping in mind that Oculus’ first standalone headset – the Oculus Go – could really only hold a charge for about two hours of use before needing a three-hour period to recharge. We can’t be sure, but the Quest looks like it’s heading in the same direction. The new Touch controllers, which are basically just smaller versions of the existing controllers, but with a tracking ring on top instead of below it, worked just fine during our time with them. There were just one or two minor exceptions when the headset lost track of our hands and the game started to shake erratically. Despite sharing some similar specs, the Quest is not a duplicate of the Oculus Go – it’s a substantially improved standalone headset that offers six degrees of freedom tracking at a level nearing tethered, PC-based headsets. We still have some concerns about missing specs and ran into a few issues during our hands-on demos but, based on what we’ve experienced so far, Oculus Quest (*cough* Project Santa Cruz *cough*) has been well-worth the wait.